If you love window treatments that offer your Statesville home an earthy, natural feel, there are some really beautiful woven wood shades you can choose from. Among the different weave patterns available in these shades, there are distinctive materials used which vary in colors, textures, and styles. In addition to the natural feel woven wood shades bring your Statesville home, they are the perfect natural insulator for your windows. Woven wood shades will also allow you to filter light through or block it out more fully, depending on the weave and materials used to make them. 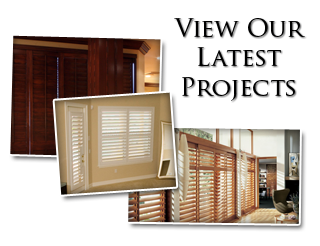 Some of the most popular woven wood shades that our Statesville shutter company sells are the styles listed below. The wonderful thing about these shades is how unique each set of shades is as compared to others made of the same materials by the same manufacturer. As the local Statesville source of woven wood shades made in the USA, we can tell you that bamboo woven wood shades are a very popular choice. Not only are they beautiful, they are very durable. Bamboo is a grass reed, not a tree, and it grows extremely fast. This means that the bamboo used to make shades is easily farmed and harvested, a wonderful alternative to wood harvesting. Bamboo woven wood shades offer superior color and style contrast when paired with curtains or draperies, or you can let them bring warmth and beauty to any room by letting them stand alone. As bamboo grows and matures, it looks more like a tree sapling than a grass reed. When it is thick enough, it will be cut into flat slats and then either woven together to make wood shades. Either way, the mature plant gives you a completely different look than woven wood shades made of grasses or young bamboo. In fact, your house guests may keep asking you what they are made of, they are truly that magnificent. When you envision woven wood shades in your mind, you’re probably thinking about matchstick shades. Most often, they are made of early-harvested bamboo when it is about 2mm wide in diameter. Matchstick woven wood shades are held together by a string which is woven vertically in and out of the bamboo. Grass woven wood shades are woven out of different natural grasses. Grass is a fast-growing renewable resource that saves the trees on our planet. Grass woven wood shades vary in color depending on the type of grass or reed used and each woven wood shade is unique from others. You get a much finer woven look than any other woven wood shades available. Since we custom-make our woven wood shades to fit your Statesville windows, just about anything can be done to customize them. 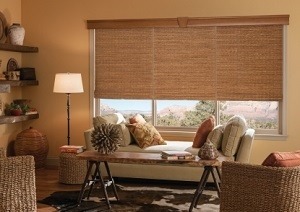 All of the woven wood shades we sell can be fitted with liners. Lined shades offer more light blockage and privacy where you need it, a perfect choice for a bedroom or windows that face your neighbors. Liners also help to increase the energy efficiency of your home. Woven wood shades can be customized with motorization. Remember, motorized woven shades are only available at custom window treatment companies like ours at Sweet Shutters and Shades unless you want to pay full price for the installation. Motorized shades can be operated or set up on a schedule by using an app on your smartphone or tablet. Imagine being able to open and close your shades while at work or away on vacation! 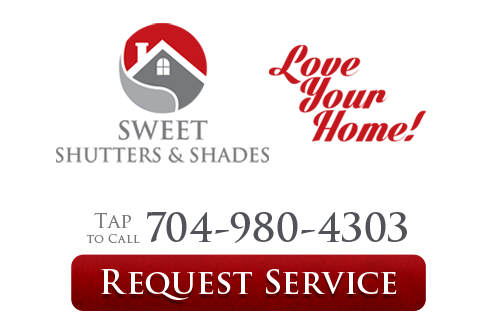 If you are looking for woven wood shades in Statesville, NC, please call Sweet Shutters and Shades at 704-980-4303 or complete our online request form.